"I knew it - I knew that God knew it - and I could not deny it." I normally choose to focus almost exclusively on the Savior when I talk about spiritual things, and for good reason. He is Alpha and Omega, the beginning and the end. He is the Only Begotten Son of God, and He is my Savior and my Redeemer. Today, however, I want to testify that God speaks to prophets. I in no way worship them. But I respect them and love them, because I know they speak God's word. He chooses them in their weakness and qualifies them for the work. Today the Holy Spirit has testified to me, again, that my Heavenly Father and my Savior Jesus Christ appeared to a young man named Joseph Smith, and worked through him to restore the pure gospel of Jesus Christ. He was not perfect, but he was sincere, and he was telling the truth. I love him for what he did. I'm feeling so much gratitude and love in my heart right now, and I want to share it. And remember it. 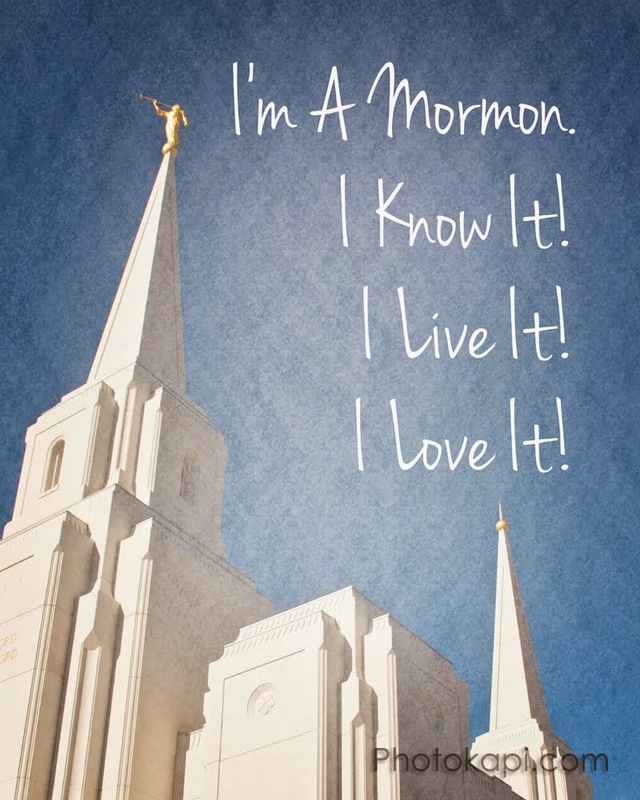 Though I've never met him, right now I feel like Joseph Smith is my friend and my brother. I'll defend him. I believe him. He was telling the truth. I hope to be a better one. I'm being emotionally stretched out and molded. I was once told by a roommate that I was like a robot, and void of human emotion. Years have passed. And now I'm being molded, stretched, and shaped by my current circumstances, and feeling all types of emotions! I like to think I'm becoming more of a real person. Either way, I'm finding it much easier to relate to others. I can now better understand what it feels like to want someone, anyone, to come and be a friend and take away some of my loneliness. I can better appreciate what a simple phone call or email can do for one's spirits. I am actually really grateful that I'm starting to understand this. I feel like my soul is growing. It's always been so unnatural for me to love others...but its starting to happen, now that I'm gaining more empathy. The first step to loving is to understand, I guess. It is really amazing to see how well God is able to turn depressing, traumatic experiences into beautiful new beginnings. To come to Christ we need a broken heart, so these traumatic experiences are the perfect opportunity to come closer to Christ and have our soul healed, our path illuminated, and our soul comforted. He is the Light, the Life, and the Way. Every broken heart experience invites us to experience Him even deeper. I feel like my pain is helping me become who I need to be, by inviting me to experience the Atonement even deeper and more sincerely. My heart is broken. But I am at peace. And I am so grateful to God, for all of it. I got to help more people with Theory today! Corinne and I helped Nick and Mary Jane after Keyboard Harmony. I told them we should have a study group after class every time, so I can teach them Theory. I hope we do. It gives me a boost of happy feelings when I get to teach people Theory. I finally exercised again. I haven't done that since before Spring Break. It felt good. Audible, visual, tangible thoughts. =) I love music. In case anyone finds this blog to be too cheery or upbeat, or unbelievable ("How can anyone be that happy all the time? "), I just wanted to make the disclaimer that I try to usually only put positive things on here. Bad parts of my day are usually written elsewhere. Because I have bad days, or bad parts to my days. But when I'm making things public, I (usually) figure that if I send out good into the universe/internet, good will come back to me. =) Or something. I started doing work today on the Vineyard website that the church made (I believe it's vineyard.lds.org). I like to feel helpful. =) I suggest it to anyone that is feeling a little self-centered or selfish, like me. =) It doesn't take up too much time. But as the quote on that website reads: By small and simple things are great things brought to pass. Well, when one wakes up at five, one is usually very very sleepy when ten-thirty rolls around. So I wish you all a good night. 24But let him that glories aglory in this, that he understands and knows me, that I am the Lord which exercise lovingkindness, judgment, and righteousness, in the earth: for in these things I bdelight, saith the Lord. Going to bed super early tonight so I can get up early and study for my Anatomy test. Please pray for me and wish me luck! Warning: This post may be slightly more negative than usual. 90% of the status updates on my Facebook news feed were about basketball. Another subject of note was the Lady Gaga concert in Salt Lake. Today, this bothered me. Do the majority of my friends know that the US fired missiles on another country today and we are now involved in another war? Are they preparing themselves against the possibility of a natural disaster like the one that hit Japan, or the possibility of radiation problems? Do they know that the moon will be closer to the earth tonight than it's been in 18 years and will probably appear bigger than any of us can remember seeing it, and would probably be a sight worth seeing? Are they thinking about people who could use a friend? Are they thinking about the spring weather and all the awesome things they could be doing outdoors? Is their soul growing in any way as a result of their activity? Are they living up to their basic responsibilities? Is what they're doing really worth it? And I definitely recognize that I need to learn to have more fun. I guess you can probably tell that watching basketball does not fit the criteria of fun, for me. Miracle of the day: finished my Anatomy flashcards!! There are lots of people that care about me. That feels good. There is such thing as drinking too much, even if the drinks aren't alcoholic. I feel yucky. Megan's friend Lauren is really nice. I'm learning to play O Mio Babbino Caro on the guitar. It's really pretty. I got to help someone in my Theory class understand secondary dominants better! And I also explained the basics of Italian, French, and German six chords. He was really excited about those chords... I was just excited I got to help somebody with Theory! I love doing that. Today involved rapping in a drum circle. Passing a test (I think) that I didn't study for. Watching a hip replacement surgery. Buying clearance craft and scrapbook supplies at the bookstore. Including a white-board! Memorizing two songs in two different keys on the piano. Talking to a fellow student who agrees with me about redistributed wealth. Sara, from my ward, also said that she would be my friend, as well as the other girls in her apartment. I like Sara. She's happy, kind, smart, fun, and empathetic. I really like the frame I painted. I like my paintings so much that I don't want to turn it into a drum like I'm supposed to, because the tape would hinder my ability to see clearly what I painted. And I just like it too much. Charles: I want to marry you. Josh: We can't get married, we're both boys. And I'm already married. To the queen. Charles: But I'm a girl, because I'm the prince! Life may have crumbled around me in the last few days...so it's about time I start counting my blessings more. I'm grateful for my iPhone, for my favorite religion teacher from BYU-I, for my sister, for hot tubs, and for sleep. I have been so blessed. I really think God has blessed mine and Jeffrey's relationship. Its weird that the two of us keep helping the other person to be better. You would think that would mean that one of us would need to be superior, in order to be inspiring the other. But no. We are just two weak people, and somehow as we spend time together we become better people. So maybe it's not us that's inspiring each other, maybe it is just the hand of God on our relationship. His grace is enabling our relationship to produce amazing fruit! =) That truly is a miracle! I really love God... He gives me so much more than I deserve! There is so much corruption in the world. So much violence, so many lies. I am excited for the day when all of that is put to an end. Can you imagine a world full of honesty? Light? Virtue? Love? Cheerfulness? Forgiveness? Intelligence? Unselfish service? Unity? Peace? I believe we'll experience that, and more. Excerpt from Jeffrey R. Holland, "The Best Is Yet To Be"
"Some of you may wonder: Is there any future for me? What does a new year or a new semester, a new major or a new romance, a new job or a new home hold for me? Will I be safe? Will life be sound? Can I trust in the Lord and in the future? Or would it be better to look back, to go back, to stay in the past? Keep your eyes on your dreams, however distant and far away. Live to see the miracles of repentance and forgiveness, of trust and divine love that will transform your life today, tomorrow, and forever. That is a New Year’s resolution I ask you to keep." I have so much to look forward to. Today's miracle is that my future is going to be awesome. God has great things in store for me. And not necessarily only in my distant and far away future. =) Life is good. It's epic.